Directly on beautiful beach, with chef and car to drive. 'Casa de las Abuelas' is located in the secure, private, gated community of Punto del Burro. It is directly on one of the most beautiful beaches in Mexico. 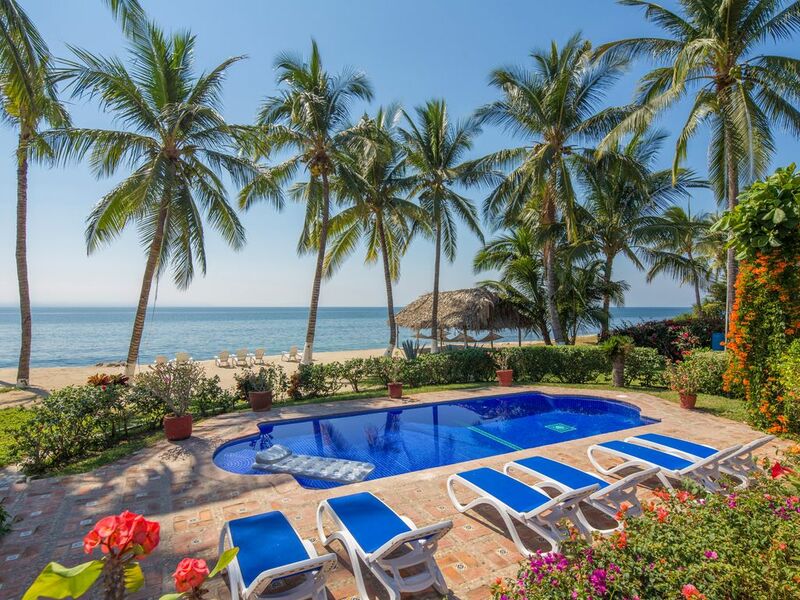 It is located 30 minutes north of Puerto Vallarta and is halfway between La Cruz & Punta de Mita. Our home is four bedrooms/four and one-half baths and can sleep eleven. The home has a private pool. Just added a new outside pizza oven. The home comes with a staff who will meet you at the airport. They will cook, clean, and do everything they can to make your vacation one you will always remember. The home comes with a Suburban for you to drive during your stay. All you need is your swimsuit! I am a 75 year old grandmother, who is soon to be a great grandmother. I have been coming to Mexico for 50 years. I love Mexico. I grew up in Lubbock, TX and have been in Odessa, Texas for all of my married life. I am a big Texas Tech fan. I was one of the original owners in Punta del Burro. When you see the area, you will know why I fell in love with it. I bought it when there was hardly anything there. Now we have cobbled stone roads, underground utilities and 24 hour security. We have all the bells and whistles. Robes are provided for you. Most times, people eat on the outside patio. Lots of seating and beautiful view. We have added a wheelchair ramp. The main level is wheelchair accessible. Second visit. Still wonderful. There will be a third. Thank you to Kathy, Juan, Baly, and Coby. Had a great time again; will go back. Spent another spectacular week; in which we went fishing a few days and took home some good fresh fish. Juan and Bailey were great to see again; along with the good charm and fine cooking. I had 6 new people with me and they were asking; when can we come down again. The only negative I had; was the construction next door during the week that went from 8 to 6; but progress has to be made I guess and it will be done in the near future. I do plan on going back again; no doubt. I'm glad you had such a good time. I was just there and Juan told me about your great fishing trip. I'm sorry about the construction. I was pleasantly surprised that the noise was not so bad. Also, they are not supposed to start before 9am. They didn't when we were there. I will let the office know that they were breaking the rules when you were there. They also are not working on Sat at all so that is good, and of course, they don't work on Sunday. Will be glad to welcome you back to Casa de las Abuelas. Wonderful private place to relax and refresh! We recently stayed in PVR from Aug 3-10 and it was everything we imagined! This place was spectacular for what we wanted - to get away and rest. Having someone cook breakfast and dinner was AMAZING! They have you choose the food, they do the shopping and are wonderful chefs. Having laundry done was a HUGE bonus! The ocean was warm and we got to go out into it almost everyday. The palapa with the hammocks was SO WONDERFUL! The pool has a shallow area that our youngest child could hang in and still fun for the older ones. Great to relax in when the ocean wasn't appealing. The rooms were great although we were not in them much. Juan, Baly and Coby were very kind, quiet and helpful. There is a resort nearby - almost walking distance - that had a wonderful spa and was a fun place to go to get out of the house for the day. Lots of animals around and nice facilities. Surfing and paddleboarding were good - nice place to rent them nearby. **This does not have to do with the home but: Even though the weather forecast said rain everyday it only rained at night and never once changed our plans. The 2 upstairs rooms are not connected to the main house so you have to walk outside and downstairs to get back inside the main house. The home is about 20-30 minutes from Nuevo Vallarta and a little further from Puerto Vallarta so be prepared to drive. There is nothing close to walk to so be prepared to stay at the home most of the time. The mosquitos were horrible - we finally had to start eating inside the house instead of in the beautiful outdoor seating because we would eat get about 30 bites each minimum at every meal. The seating in the living room isn't suitable for a ton of people so most of your group time will be outside. Overall we would go again if we could get a mosquito situation - it made the trip hard to fully enjoy but we spent most of our time on the beach anyway which made it worth it. I am happy that overall you had a great time. However, I'm sorry that you had some Cons. I'm sorry that you didn't know that we were not in a town. Many people see this as a plus, but you didn't. I never go to Nuevo Vallarta or Puerto Vallarta as it is too far and we have such good restaurants in Punta de Mita, Bucerias and La Cruz. I do have my favorites listed in my book at the house. The only way I could add 2 bedrooms was to do it as we did. This is very common in Mexico for some of the bedrooms to be entered by the outside. As for mosquitos, we try very hard to control them. Aug and Sept are a "buggy" time and I'm sorry they were a problem. To begin with the airport pick up is fantastic. The house and grounds are exactly as you see in the pictures, Stunning views right on the sand with a great pool. Baly Coby, and Juan were amazing host. The food was wonderful, anything we requested we had! Thank you for making our family vacation over the top! Beautiful staff, property, and setting...we’ll return! We stayed a week in July. Our group of 6 adults and 5 children couldn’t be happier with our vacation. Baly, Juan, and Coby worked so hard to make sure the house was in stellar condition and that we were well fed and hydrated. And the best part was that they always did it with a smile. Thank you Kathy for sharing your home. I can’t wait to go back. Great location beach-front on a private 24/7 secure beach in a wonderful, small neighborhood. Home is in great condition. All the grounds & amenities are well taken care of, looked after and in perfect working order. Location is absolutely second to none for a relaxing beach get away. What puts it over the top is Juan and the staff. Friendly, knowledgeable and hard working...they made the stay 5 star. Great job Kathy you have raised the bar! Can't wait to get back. Thanks for all your kind words. You are right. Juan and Baly are what makes the villa so great. Hope to see you soon. Punta del Burro is a beautiful, safe, gated community on one of the most beautiful beaches in Mexico. This will be one of the most relaxing vacations with Juan and Baly cooking, making drinks and taking care of you. You will never want to leave. Rates do not include holiday rates. Please contact me for holiday rates.